So, why was the Digital Humanities Summer School Bern important for research libraries, and why were libraries and archives so markedly absent from the Wordies produced from the conference literature? I’m not sure if I agree with the term enterprise, but the future trend appears to be that more and more traditional services will be outsourced and information services redesigned to accommodate and support the digital researcher. Against a context of rapidly diminishing budgets, significant rises in the costs of electronic and digital services, and the arrival of new cataloguing standards, the transition to providing these new types of services will involve a lot of courageous prioritising and planning which will probably have to happen fast. This is why it is important for libraries to engage more with their researchers, and why Digital Humanities Bern was such a fascinating event. To successfully enable transformation, the library – user relationship needs to acquire a new dynamic and become more collaborative. With increasing researcher involvement with the internet and the digital, in their traditional role as providers of access to information, libraries will have to forge new relationships with their users, and this will likely involve the creation of an environment where these newer sources of information and data can be accessed, processed and preserved for future use in a more organized form. This includes providing access to and actively interacting with tools that allow researchers to harness the overwhelming amount of data available on the internet, and the large quantities of digitized material accessible through it. Digital Humanities Bern provided an extensive overview of the new directions in thought and the different digital technologies and methodologies being used by humanities scholars. In her presentation on History and Digital Humanities, Susan Schreibman highlighted the difficulties of defining the “field”. Ray Siemens illustrated the changing approaches to research and teaching patterns and how tools are currently being applied in his session on Social Knowledge Construction and Creation in Literary Studies. Elena Pierazzo presented the latest thinking in Digital Text encoding and showed how difficult documents and texts could be enhanced by scholarly editing, and Frederic Kaplan looked at the different ways of using technology to create knowledge using the example of the Venice Time Machine project. It was a good opportunity for reflecting on how libraries can evolve from the provision of traditional two-dimensional services into the realm of the born digital and the multidimensional to support researchers in their work. Providing access through traditional library catalogues to print or by means of digitization or subscriptions to digitized material processed by optical character recognition (OCR) will no longer suffice. It is of little use simply to invest large amounts in digitization without providing funding for its subsequent processing and application in research. As noted by Tim Hitchcock in his article, ‘Confronting the digital”, and illustrated by Guido Koller in his workshop on Interpretation of Digital Records, the best optical character recognition programmes can only operate up to 80% efficiency, and can only be used with typewritten documents, significantly affecting the quality of the data provided, and often severely limiting and distorting the corpus of data available for research. Unless digitization is accompanied by some form of encoded transcription editing to facilitate the automatic extraction and filtering of data, it could hinder rather than help researchers. On the other hand, the promotion of good encoding with scholarly editing for the interpretation of more complex texts such as that used for the Proust project at King’s College London presented by Elena Pierazzo can enrich and provide added value to research library collections and make texts accessible for search engines and data mining tools. The tools are already out there, and many more are being created as we speak, what remains to be seen is how research libraries can harness this dynamic to promote and support research. As David Berry mentioned in his course on Critical Digital Humanities and in his article on the The Computational Turn, the development of research infrastructure and processing of digitization belongs to phase I of the digital humanities, with phase II involving the evolution of tools with which the information, knowledge and data produced by phase I infrastructure can be elaborated. The need for a “slowdown” to allow reflection on the implications these tools, methodologies and technologies are having on research was also seen as important. In their role as repositories, providers of access to information and promoters of research, libraries could develop the infrastructure to support and promote phase I activities as well as providing an environment for phase II developments. 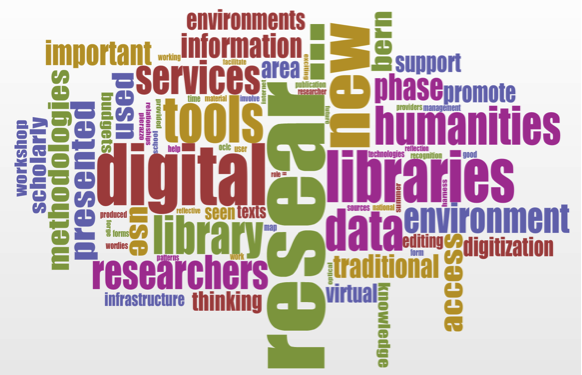 A virtual library area or virtual research environment (VRE) for a reflective unrolling of the acronyms would allow researchers to see, experiment with, develop and share new digital tools and methodologies for their research in a controlled but independent area where their activity could be documented and stored for later use. An exciting example of what such an environment could do and how it could mine data from other sources was presented by Lukas Rosenthaler. Curation and preservation of this area would permit sustainability and encourage reflection and the reflective use of tools and methodologies over time. Collaborative research will enhance results and relevance and help promote inter- and intra-disciplinary research as well as inter and trans-national collaboration. A few examples of new tools and methodologies presented at Digital Humanities Bern which could be used for this were the network analysis presented by Claire Lemercier which allows closer and more distant overviews of data and relationships with zoom-ins, the visualization with Gephi workshop by Martin Grandjean which could be used to map and visualize processes, and the workshop on zotero and citation management software for management of bibliographic and other research resources by Nicolas Chachereau. And new directions, tools and forms of research are exactly what research libraries should be promoting. Budgets and national academic cultures permitting, libraries could use their VREs as a repository and interactive area for scholarly publication. Researchers and library alike would be able to benefit from open access publication to promote and promulgate research, while documenting the scholarly product and process. These conclusions are also supported by new thinking and acting in library environments, as illustrated in the presentation given by Kurt de Velder of the University of Leiden library at OCLC in May 2013 on their new virtual research environment vision and redimensioning of their library services. What would be even more interesting is to see how these virtual research environments could be umbrellad under larger environments to facilitate findability, interaction and research across environments and national boundaries to forge new forms of transnational and interdisciplinary collaboration. Digital Humanities Bern was an inspiring experience, illustrating how important it is for research librarians to engage and collaborate with researchers to understand their work patterns and tools in order to establish new ways of working together instead of working on the ‘if we create it, will they come’ scenario. And this may well be an explanation for why libraries and archives were absent from the Wordies presented at the summer school. What remains to be seen is whether research libraries will be able to take up the challenge and redimension their traditional tasks and services to make room in their budgets to embrace and enhance the exciting developments in the digital research world.